Appearances can be deceiving. As a long time horror fan, the story of Eko Software’s How to Survive sounds right at home of a direct to video feature film off in the corner of a local video store – A survivor maroons on a sandy beach of an island archipelago and immediately discovers he is in the middle of a zombie apocalypse. 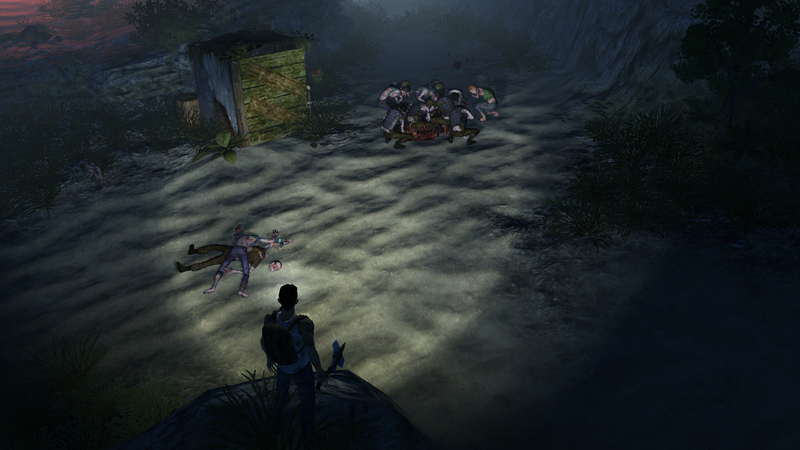 Using a unique set of skills and with the help of other stranded people, the castaways must band together to survive and escape the horror of the islands. Doesn’t sound like much, but give me some gory zombie action and some good gameplay, and I’m all in. And for the most part, that is what How to Survive is. What it lacks in originality, it more than makes up in ambition, presentation, and polish and amounts to a really good game with some questionable decisions along the way. From the outset, you’re given a choice of one or three characters. First there is Kenji, who has high precision, and moderate health, stamina and strength. Then there’s Abby, who has high stamina and precision but low health and strength. And finally there is Jack, who has high strength and health, but low stamina and precision. Once the choice is made, your chosen survivor wakes up on a sandy beach and immediately runs afoul of the island’s undead inhabitants. You find another survivor and thus begins your quest proper. One quest giver leads to another and then another until you have covered every inch of the 4 islands in the archipelago and ultimately make your escape. Along the way, your chosen survivor will encounter an ensemble group of characters, each with their own mini-story and reason for being on the island. You won’t really get to know these characters much beyond their few lines of adequately delivered dialogue but the game does feature an interesting twist, that while I can’t say I didn’t see the “what” coming, the “why” makes it pretty interesting. Inexplicably, all three player characters are voiceless so the dialogue literally plays like you’re hearing line reads from an actor in a recording booth. It’s never bad, but it’s also never very good. I suppose it’s unfair to lay this at the feet of the game, but this year alone has seen an astronomical amount of stellar voice acing in video games, so here it just kind of stands out as unintentionally funny and uninspired. The one standout, however, is Kovac, the Slavic local who has not only made a home for himself on one of the islands, but is also writing a book called “Kovac’s Rules” with all sorts of tips and advice on how to survive the islands and the zombie outbreak. It’s all animated and narrated with a dose of humor as delivered by Kovac’s voice actor, who goes uncredited. Anyone who is steeped in modern zombie game culture knows what to expect here – ranging from Soldiers, who are armored, and Tall zombies, that can’t be decapitated by melee weapons, to the bombers that explode upon death or in proximity to the player, and a Giant – the half decomposed behemoth that charges and throws other zombies at you. If that all sounds familiar to you, that’s because it is and very much so, but really the similarities end there because How to Survive features what could very well be a first – zombie ostriches. There are also zombie crabs and bucks, but zombie ostriches are the most hilarious and surprising of the bunch. In certain areas on the islands, you will also contend with piranha that thankfully have indiscriminate taste and will chow down on any zombie fool enough to enter the water. While the enemy types offer up a relatively safe and derivative route in the creativity department, the game also culls some gameplay mechanics from other popular games, and surprisingly, does some of them better. For example, one of the complaints leveled at the most recent Tomb Raider is that the game introduces the concept that Lara will have to hunt for food to survive, only for the concept of hunger to never play into the story or the gameplay. Well, if you’re one of the people that complained about that, How to Survive has got you covered. There are 4 meters for players to monitor in order to survive the islands and escape. The first is health, which works as standard health meters work – the less you get hit, the more health you have. The second is hunger – as the day wears on, the longer you go without food, the weaker you become and the less damage you do to enemies. The third is thirst, which depletes the fastest. Going thirsty will cause your aim to worsen and make it take longer to line up targets. And lastly, there is “tiredness” (why the developers didn’t go with “exhaustion” or “fatigue” is anybody’s guess) which drains the longer you go without sleep. Simply drinking crafting health items, eating food, drinking water and sleeping, solve all of these. Sounds easy enough, right? Well it would be, except resources and safe zones are relatively in short supply. Also, some of resources at your disposal serve multiple, practical uses. For example, those rags you find can be mixed with a special herb to create medical bandages, but it can also be used for Molotov cocktails, which work incredibly well when dealing with hoards of zombies. That bottle you want to use for making Molotov cocktails – it can also be used to transport drinking water, which can only be found in wells scatted sporadically across the islands. Killing indigenous – living – wildlife, drops edible and life giving meat, but first you have to cook it with a campsite fire. That same meat can be mixed with a Molotov when thrown attracts the undead to it before exploding in a glorious, zombie charring blaze. Meat can also be used in it’s uncooked form to distract large groups of zombies allowing you to make your escape if you are running low on health and ammo. Also, there is fishing in the game and even though I only used it once, it’s a nice touch that it’s included. Sleeping can only be accomplished at the scattered, and few, safe houses. The only caveat is that before you can first use a safe zone, you have to purge it of the undead menace. Opening a safe house with a red light triggers an alarm bringing undead from all over to contend with. Once the hoard has been dealt with and the light is green, simply lie down and get your 40 winks. There is a also a day/night cycle in How to Survive that when caught in the wilds after sundown, you’ll have to pay close attention as Night Crawlers, a special breed of fast moving zombies, will approach you from the dark beyond your flashlight. Training your flashlight on them will cause them to run off and reassess their attack. 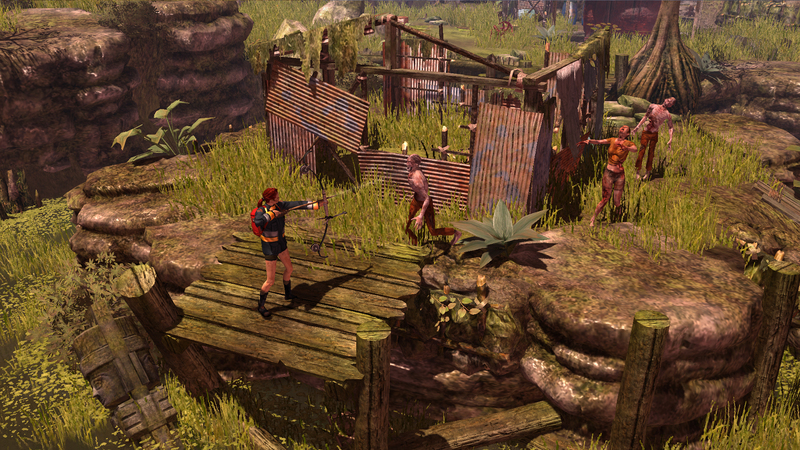 At first these enemies can be daunting to deal with in addition to the regular assortment of island undesirables but as you level up and craft more powerful weapons, they become less of a threat and more of a pest that needs to be stepped on and forgotten. Killing enemies and completing quests gives you the XP that, as is standard allows you to level up your chosen character. Leveling up gives the player one skill point to allocate into one of 19 slots with a large portion of them being specific to the character. For example, while all of the players can craft a bow, only Kenji can craft a much more powerful crossbow. Abby, for instance, can earn more XP at night and so on. While I suppose I could have grinded to get the XP to unlock everything, by the end of the game, which took a lengthy 15 or so hours, I only had 13 of 19 slots filled and it was fine. How to Survive has a lot of good ideas that are well executed, but if I were to focus on the two areas where Eko Software nails what is doing it would be the controls and crafting system. Moving the character with the Left Stick and aiming with the Right, controlling the character couldn’t be easier while shooting and attacking is handled by the Right Bumper and switching between your melee and ranged weapon is handled by the left. And pressing the Y button does cycling through available weapons. Using the D-pad gives you quick access to usable items – the Left Trigger allows you to use the inventory object. For instance, with a piece of meat highlighted, walking up to a campfire and holding the Left Trigger cooks the food to be eaten later, replenishing your health and hunger meters. Having an empty bottle equipped you can either fill the bottle with water for later use, or fill it with gasoline to craft a Molotov which can later be mixed with fertilizer and create a bomb to blow up barriers, giving access to either shortcuts or close off portions of the islands. Crafting is fairly deep and in all honestly, quite logical. Using real world items a harpoon gun handle, a manual compressor, some nuts and bolts and combining them together will game a handgun. Fastening some fishing wire with a tree branch will make a bow. Sure it’s being pared down for the sake of the game, but I do appreciate the approach to some real-life science and physics here. There’s a lot of things to create in the game and none of it ever feels as if the things being crafted wouldn’t actually work in practical application. It’s a neat touch that could have been handled in much lazier, broader sense. This goes for food and health items as well. There are over 80 weapons to created, including a three-armed boomerang made out of bone and serrated flint, a precision rifle for long distance head shots, a and high capacity chainsaw, for quick, gory dismemberment. You can even upgrade your existing weapons to give a 50% power boast, by completing side quests. All in all, I think I managed to create and use maybe 18 to 20 of the possible 80 weapons so there is plenty to create in a game like this. Another, albeit minor, piece of the design I really find impressive, is that instead of standard loading screens when going from island to island, the game quizzes you on what you’ve learned so far in the game, and every correct answer gives you 15 XP. Usually the load times will give you enough time to get at least 2 questions in, possibly a third. It’s a great design decision to help alleviate the tedium of looking at load screens. 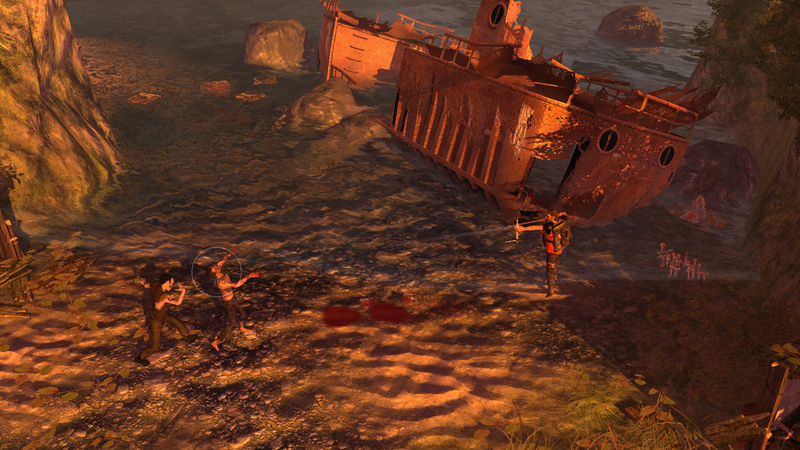 In terms of graphic and sound design, How to Survive looks good and sounds even better. The lighting gives real-time shadows based on not only the source but the time of day as the shadows move with the passing sunlight. The island is beautifully rendered, and animations are fluid and zombie deaths are pleasingly gory, chunks of body parts will liter the ground and roll depending on the shape of the surface. Another touch that I greatly appreciate, is that every item and armor upgrade is visually represented on screen. If your character fashions a helmet with a gas mask, you’ll see them wearing that very helmet. If you manage to fully upgrade your weapon of choice, you’ll see that upgraded in your character’s hand. Like I said, it’s just a touch, but it really goes far to show the staggering attention to detail on display here. Each and every new environment looks properly dilapidated and gives off the impression of a long history. As mentioned before, the voice acting is adequate and that is honestly the worst thing I can say about the sound. Every gun has a satisfying thump or thwack to it, made even more so by the gleeful sickening splat of the zombie’s head exploding from impact and the sickening sound of the Bombers when they explode, taking close by zombie’s with them. Oceanic sounds of the sea washing on to the sand, birds chirping, evoke exactly the right kind of deceiving beauty and calm that belies the horrors that lurk beneath the island vistas. The score, by Daniel Sadowski, is equally impressive. Simple, thumping, effective and evocative of the kind of synth scores in George A. Romero’s Day of the Dead or all of John Carpenter’s late 70’s to mid 80’s movie scores. When it hits the fan, the music ramps up suitably and fades when the coast is clear. Once you’ve completed the story mode, there is a challenge mode to tackle. One or two players will be given an empty back pack and will have one simple task. Escape the island without dying. When I say, “simple” I mean in concept, because the actual execution will require a decent amount of skill. The challenge comes in the fact that you only get one life – if you die it’s back to beginning with none of your accumulated experience, equipment or weapons. Though available from the outset, challenge mode should really be attempted once you have properly leveled up your character and understand the controls and shortcuts. You will need every trick in the book to complete the challenges and get that elusive “S” rank. For all of the things that Eko Software does right, there are some things that they get wrong that somewhat hamper the game’s overall quality. While the game remains almost bug free (more on that “almost” later) the number one issue I have with the game is in the saving and checkpointing. While checkpoints are fairly generous, saving only occurs when a mission has been completed. Due to the nature of the game – survive with limited resources – some missions can take longer than others while trying to slowly make your way from one end of the island to the other, and often times back again, so it can take quite a while to turn in that mission and get the save. The issue with this is that because it doesn’t save at the checkpoints, turning off the console without completing the mission for reasons like, I don’t know, life, means that all of the progress is gone and has to be done over upon the next time you start up the game. This wouldn’t be so bad for someone who has the time to do that, but hedge cases don’t make for sound design decisions. And remember that “almost” when talking about the bug-freeness of How to Survive? In my entire playthrough I encountered exactly one bug. I was turning in a mission to receive that ever so coveted saving notification, except the quest giver wouldn’t accept the quest. I would get the beginning dialogue but it wouldn’t end, no matter what I did, so I reset the game. Unfortunately, this is also how I found out that game progress didn’t save unless the mission was completed. So about 30 minutes of game time was all but wasted. I’m not damning the game for this because it worked fine the second time, but rather using this point to illustrate the issues with the game’s save system. It is perfectly clear that How to Survive is meant to be played with more than one person. Obviously, a single player option is available, but with local and online co-op, the game is designed to be played with someone else. As this is a review of an advance copy of the game, I was unfortunately unable to play the game with a partner. This made the game incredibly difficult at times. Without having someone there to revive me, I died a lot, which meant a lot of load screens and retracing my previous steps and a whole lot of deja vu. Even though there are 4 islands to explore and scour over every single corner, there is no mini-map so it means a lot of pressing the back button to access the map and get your bearings. It doesn’t break the game, but it does hamper the pacing a bit and I would have expected an exploration heavy game to include one on the HUD. What is on the HUD, are a lot of tutorial prompts for the first hour or so of the game. While these prompts are often useful in other games, here they are little more than distracting intruders. What’s worse is that it’s the same 3 or 4 things over and over again. It takes up valuable screen real estate, it’s repetitive, it’s unnecessary and goes on for entirely too long. There is also no way to turn off prompts in the game so you’ll be stuck looking at them until you’ve made the appropriate amount of progress the game has determined. The camera is fixed, which means you have no direct control over what you see on the screen beyond moving your character around the map. The character is generally always centered but sometimes the camera will lose behind the trees or geometry. It happens often and can be frustrating losing precious bars of health from your character when not being able to see or clearly aim at what is hurting you. This last bit may not seem like a big deal, but I felt the need to include here. By the end of the game, I was so overpowered that one of the last few missions, which requires the player to visit all of the islands again, was more of nuisance than fun. This means the last during the last portion of the game kind of peter out due to pacing. At the same time, picking off enemies in one shot can still be incredibly satisfying. At first glance, Eko Software’s How to Survive might seem incredibly derivative of AAA titles like Left 4 Dead, Dead Island, Far Cry 3 and even the Tomb Raider reboot. 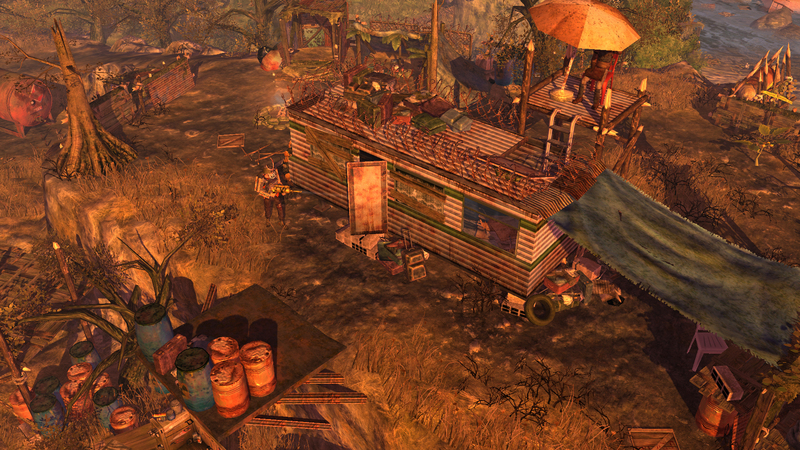 The game features many well-worn tropes in zombie and survival games, such as enemy types and weapon crafting and a generic name, but to write it off on what it appears to be would be to miss what How to Survive is – a good game with lots of interesting ideas and well executed gameplay mechanics, mild RPG elements, a decent- if generic – story, some punishing difficulty peaks and valleys, and moderately long running time. If it hadn’t been for some truly mind-boggling design decisions, How to Survive could have been a great game instead of simply being a good one. That being said, it’s worth your time and money and I personally hope Eko gets to improve on the promise shown here should the opportunity arise for a sequel. Sean completed How to Survive on the Xbox 360 with review code supplied by 505 Games.